well, tried to up load a video, but it is too big for this blog. check it out on face book at. I am sure that I posted something under this category, but now I see nothing. Well, it was terrible, and I feel so bad for the people up in Tohoku. And with the Nuclear Power plant troubles things are just not going to get better any time soon. 1056 quakes so far since 3/11. Wait till 1430 for 3/11. then you will see what it was like! All the best to those in Tohoku. And thanks to all the volunteers, Jeitai, and US military and all the others for the help. Every day I take Max on 2 walks. Sometimes 3. If we go somewhere (Karuizawa, Chiba...) may be 5-6 walks a day. Some are very short. Max seems to have a weak stomach, so we have given him 3 meals a day. We are lucky as we have the time (read I have the time, mostly) to be home during the day time for his lunch. Usually 1 walk is between 2-4 hours. 1 walk is about 40 minutes. Today he did 40 minutes, 3 hours and another 20-30 minutes. He is a very relaxed dog, meaning if we are not walking, or we are not playing with him, he sleeps. Now most of my students are 'Kaishain' or office workers. And so was I. I always had to balance how much money I wanted vs. how much I could practice. Not an easy decision. I am not going to say what you should or shouldn't do. But what if your instrument were an animal????? Well, there is just not enough info to write a blog about cello only. At least not from me. So, I am going to write from time to time about Max. As I spend more time with him than I do with the cello, I think that he is more important anyway. I must say, again and again that he is the best dog that I have ever had. Now, during lessons at my home he will sleep and wait until he can play with my students. He knows which students want to play with him, and better, which do not or might even be scared of him. Those people he will leave alone, and just look at. Every day that we can, we go to the park near our house. 2 kilometers each way, and about another 2-4 around the park. He does more as he chases a ball for some time. Loves the ball. 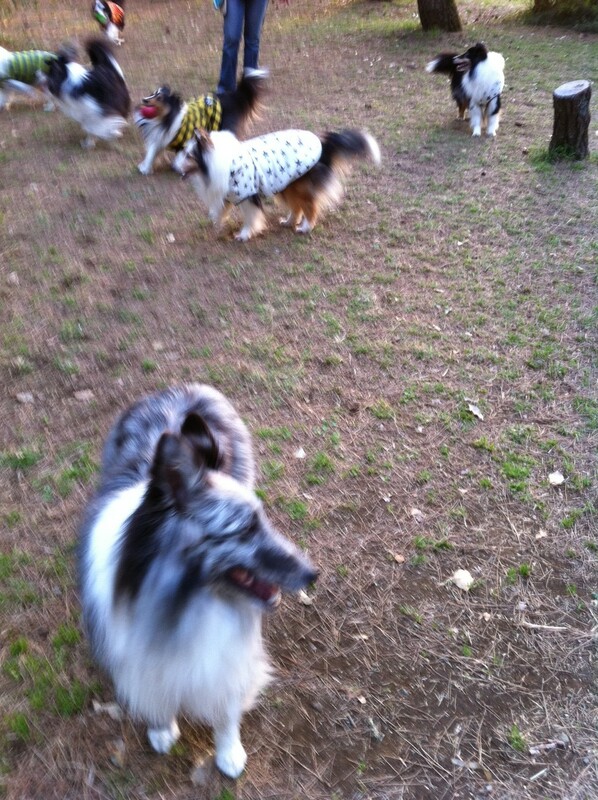 Gets to meet other dogs, sometimes there is a sheltie party when I meet the other sheltie keepers at the park. On March 11, 2011 we had a huge earthquake and tsunami. My heart really goes out to all those people in north Japan who are suffering so much. I plan to make a donation as soon as I can, but as I am not rich, (far from it) it wont be much, but as much as I can. Here in Tokyo we had a lot of shaking, and it was very scary. many things fell from the shelves, but nothing broke, and we were not hurt. On one web page, it said that we had "moderate" shaking. Wow, if that was moderate, hate to think of what it was like where they were. The videos of the tsunami are truly disturbing. I have heard people on Facebook calling for donations to be sent. I would suggest a respectable group like Red Cross or your church. One thing that did fall down was my cello. Luckily, there was no damage to it. (which is why I am writing this) ideally, your cello should be on it's side when not in use. But if you live in a small place as we do, that is not always possible. My cello is usually wedged between a wall and a table, but I was just about to leave for work when the quake hit. My partners cello was where mine should have been (2 cellos together) and it didn't fall, nor move much at all. In another apt. I loosely tied it to a support beam, but I am not so sure that was a good idea, as the case would bounce off the wall a lot. So, do what you can for those in the north part of Japan, and do what you think best to keep your instrument safe. Never know what will happen.